One of radio’s most beloved shows. During the height of its popularity almost the entire country listened to Amos ‘n’ Andy. Even the movie theaters scheduled their features so they could pipe in Amos and Andy. Starring: Freeman Gosden and Charles Correll. 20 half-hour episodes with original commercials, digitally remastered and restored for your listening enjoyment. 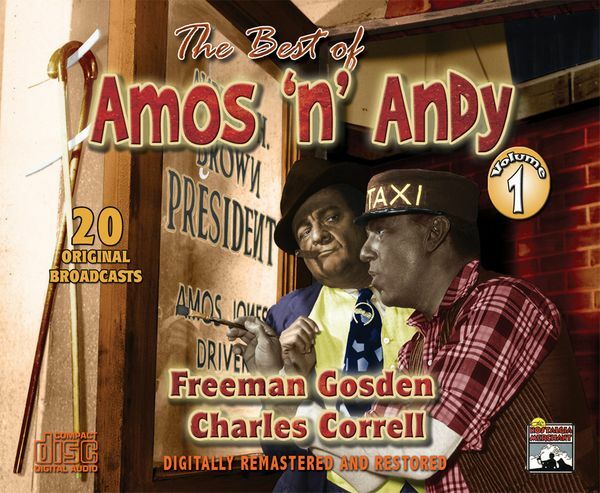 Amos and Andy - Freeman Gosden and Charles Correll made their debut on radio on January 12, 1926, as the blackface characters Sam ‘n’ Henry. The program was carried on WGN, Chicago. On March 19, 1928, over WMAQ, Chicago, the introduced Amos ‘n’ Andy, which went on to become one of the most popular and longest-running programs in radio history. The series ran six nights a week for a while, then five nights. During the height of its popularity almos the entire country listened to Amos ‘n’ Andy. Andy’s New Wife – 10-8-43, The Maestro – 10-15-43, The Locked Trunk – 11-5-43, Matrimonial Mishap – 11-12-43, Man’s Best Friend – 12-26-43, Candy for Caroline – 12-3-43, Bookends and Babies – 12-10-43, Marriage Counselor – 12-17-43, Ink Flow Fountain Pens – 12-1-44, Brazilian Brass – 12-8-44, Andy Fakes Suicide – 12-15-44 – Christmas Show – 12-22-44, New Year’s Show – 12-29-44, Honesty Ins. Co. – 1-5-45, Old Love Letters – 1-12-45, Adoption Woes – 1-19-45, The Lovelorn Column – 1-26-45, Breach of Promise – 2-2-45, Andy, the Phony Soldier – 2-9-45, The Bad Valentine – 2-16-45.